At any given point in time, there are plenty of three-dimensional prints manufactured at Smash Design. As previous blog posts mention, Smash can design anything and everything, whether 2D or 3D. For that reason, we found the following story quite interesting: Recently, a grad student made headlines with his version of a typical, everyday arm cast. Jake Evill, designed a 3D printed orthopedic arm cast that makes the patient look like a modernized Spiderman. How does it work? According to Evill’s site, the cast’s creation process is quite simple. First, the injured limb is x-rayed to detect the exact point of fracture. Once that is pinpointed, the limb is scanned to measure the dimensions. As Evill’s site then explains, “[The] Dimensions and data are fed into the computer. [The] Cast is generated with optimal support for vulnerable areas and to the exact limb size for a snug fit.” The cast is described as very light yet incredibly strong. The cast, dubbed the name “Cortex,” does a great job of linking medicine to design. This fascinating and innovative nylon print product is so manageable and user-friendly, it has enabled the traditional orthopedic cast to finally get caught up with modern age! It’s about time that we no longer have to endure the days of a smelly, itchy, heavy, bulky and uncomfortable arm or leg cast. Which now begs the question- what else could people be missing out on? Is there some kind of 3D scanned bike helmet on its way? 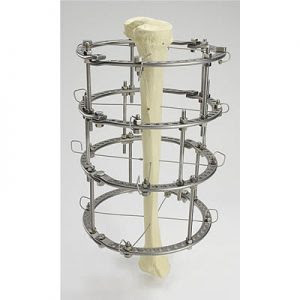 Or some kind of cast that corrects deformities or lengthens bone like the Ilizarov frame? This 3D designed cast has possibly sparked a new thinking process for how medical problems should be solved. Could it be that a company like Smash Design could someday be creating custom 3D prints for use in modern medicine? Only time will tell. Interior Design for Maersk, see how Smash transformed their new corporate offices. Levi Crowley on Need Fake Rocks? I consent to 3d Signs, Foam Props, Art Fabrication, Smash Design collecting my details through this form.